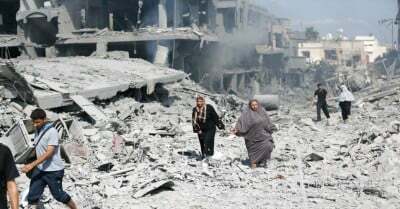 Dozens of aid agencies have called for international sanctions on Israel over its continued illegal blockade of the occupied Gaza Strip and the fact that six months after its deadly and devastating assault, there has been virtually no reconstruction in the territory. The report, “Charting a New Course: Overcoming the stalemate in Gaza,” signed by 46 international nongovernmental organizations working in Palestine, says that Israel must lift the blockade and allow free movement between the occupied West Bank and Gaza Strip or face punitive consequences. The report’s signatories, including Oxfam, Save the Children, KinderUSA, Medical Aid for Palestinians, The Carter Center, Norwegian People’s Aid and Médecins du Monde Switzerland, also call for a suspension of arms transfers to Israel and revocation of arms export licenses. Making EU and other international relations with Israel conditional on it meetings its legal obligations, including using the EU-Israel Association Agreement as a form of pressure.